I often joke with my patients that there is evidence of my perfectionism hanging on my office wall in the form of my higher education degrees. You don’t have to attend graduate school, however, in order to be a perfectionist. Perfectionists tend to buy into the belief that they can always be better and do better and should always strive toward this betterness. We could make the argument that this belief might serve us well, helping us to accomplish a great deal in life, right? There’s nothing inherently pathological about the drive to excel. Many of us are motivated by the desire to be good at something, and that can be a positive. Research informs us, though, that striving to be not just good but faultless can be a risk factor for all kinds of problems, including depression, anxiety, and eating disorders. Think about this for a moment. We move more easily through twists and turns of life when we have a flexible approach that helps us adapt to change. Rigid thinking of any kind doesn’t allow much flexibility. Depression, anxiety, eating disorders, and low self-esteem are all problems that tend to involve rigid thinking about ourselves, often including an unforgiving attitude about our own flaws and mistakes. It’s easy to see then, how, perfectionism can also be a risk factor for relationship problems. If we hold a rigid and unforgiving attitude towards ourselves, we may project this outward onto others, expecting them to be perfect, even feeling hurt and disappointed when they’re not. When we buy into the perfectionistic belief system, we buy into impossibly high expectations for ourselves and others, and this means we set ourselves up for disappointment over and over again. Does any of this sound familiar to you? If so, you may be a perfectionist. Welcome to the club! So, is there a “cure” for perfectionism? Two concepts come to my mind as good salves for the harsh beliefs of perfectionism: acceptance and compassion. Let’s start with acceptance. The practice of acceptance is allowing life to be as it is and choosing not to fight with reality or facts. Sounds simple, right? Actually, it can be quite challenging. I often have to remind myself and others that acceptance does not equal liking or condoning or wishing for more of something. It simply means accepting what is or what has come to pass. 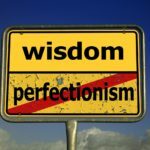 When it comes to perfectionism, the practice of acceptance may need to involve recognizing that nothing in life is perfect. Indeed, it is a fact of the human condition that we are all perfectly imperfect. Consider this: there is a Japanese practice called wabi sabi that involves not just accepting but actually embracing imperfections in everyday life. (Click here for a lovely article that describes wabi sabi in more detail). I like the idea of this practice very much (and it’s just downright fun to say). Life is absolutely, positively guaranteed to be imperfect, so why not have a practice to help us find ways to accept and respect that reality? We could probably all use a little more wabi sabi in our lives but, shhhhh, don’t spread this around too much. It could put me out of business. Back to the title of this week’s blog. I’ve been doing my own acceptance and compassion practice around the notion that I will likely have typos and grammatical missteps pop up now and again in my writing. I am cultivating an internal softening about this and have decided that the occasional typo could represent a little wabi sabi for me. So, if you notice a typo and it’s a big, honkin’, embarrassing one that could jeopardize my career and reputation as a decent human being, please do let me know right away. Otherwise, please know that I am simply practicing being human.